Global Aktionstag Veranstaltungen fanden in mindestens acht Ländern statt: Finland, Deutschland, Grossbritanien (UK), Palästina, Nederland, Spanien, Schweden und USA. Mehr als 60 Veranstaltungen wurden bis 03. Oktober auf http://globaldayofaction.nationbuilder.com gelistet (35 Veranstaltungen für den 04.Oktober, 12 für die Tage davor, und 15 für die Tage danach). 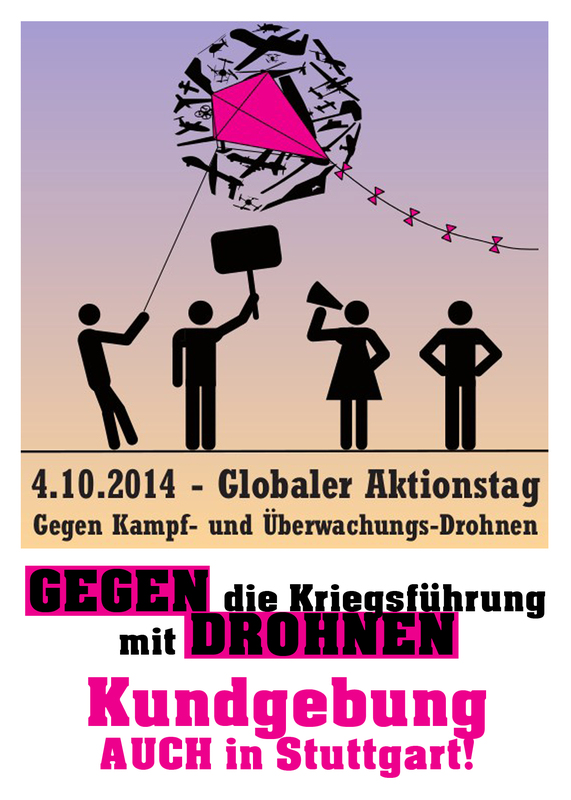 Am Samstag findet ein weltweiter Protesttag gegen Kampfdrohnen statt, 25 Aktionen allein in Deutschland. nachdenKEN über: Am 3. 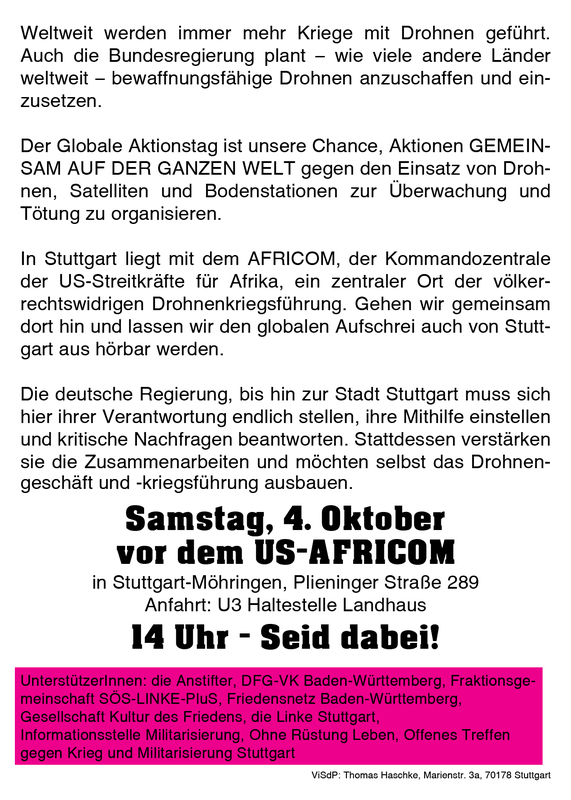 Oktober gegen die NATO-Kommandozentrale in Kalkar! Fifty to 100 anti-drone protesters are expected to turn out at the Hancock Air Base Sunday in Mattydale, according to organizers. Two groups, Upstate Drone Action and theSyracuse Peace Council, will be demonstrating against the use of drones for surveillance and attacks starting at 1 p.m. near the entrance to the 174th Attack Wing of the New York State National Guard base. DeWitt has issued a permit for the demonstration, and law enforcement officials have asked the base to designate a protest area, according to a news release issued Friday by New York State Division of Military and Naval Affairs. Protesters have been demonstrating against the drones since 2009. In February 2014, 12 members of the Upstate Coalition to Ground the Drones and End the Wars were sentenced to 15 days of jail by a DeWitt judge. Mary Anne Grady-Flores, 58, received a one-year sentence in Onondaga County jail for violating an order of protection. Jack Gilroy, 79, received three months in Onondaga County jail plus three year probation on top of a $1,000 fine. Carol Baum, a member of the Syracuse Peace Council, began protesting about five years ago when Reaper drones came to Hancock Field. She said local protesters are not feeling deterred by the arrests which she believes are part of a strategy to make the penalties harsher.